E-Zee Cut® Extra Stable 2.5 ounce is a medium weight, Cut Away stabilizer. It is a low profile backing with grids within the core to provide extra stability without the extra bulk of a lofty backing. The softness of this backing makes it ideal for us on garments that will be worn against sensitive skin. Use for high stitch count designs with medium to heavy weight fabrics. Cut Away backings should be used for unstable and knit fabrics. 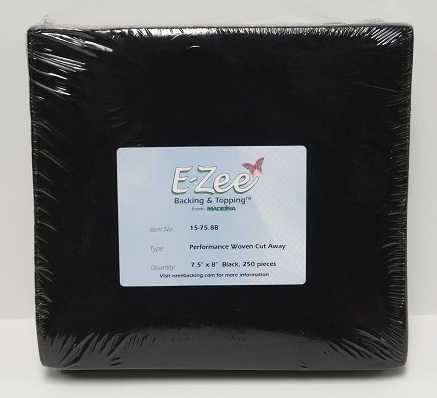 Please note that E-Zee Cut® Extra Stable 2.5 ounce is made of 100% polyester. Applying direct heat from an iron may cause melting. Use a press clothe and low to medium heat if ironing is necessary. Always test with the lowest heat first.